Walter Clyde “Puggy” Pearson was born in Adairville, Kentucky on January 29, 1929. His family moved to Tennessee andPuggy Pearson quit school when he was in fifth grade. He had picked up the game of pool and helped support his family, which included his nine siblings, with his winnings. Puggy Pearson earned the nickname “Puggy” when he was trying to impress some girls by walking on his hands. He fell and flattened his nose, and people started calling him “Pug” when he was out playing pool. Puggy Pearson started playing poker games while he was in the navy. When he left the navy after serving three tours, Puggy Pearson was $20,000 richer from poker alone. Puggy Pearson is credited with being the person to create “freezeout” poker tournaments, where all the poker players start with the same amount of chips and play continues until one person has all the chips. Puggy Pearson is also the only person to have been recorded as attending every World Series of Poker Main Event from 1970 to 2005. Puggy Pearson has four WSOP bracelets, two coming in Seven Card Stud, and two coming in No Limit Texas Holdem, including the 1974 World Series of Poker Main Event. Puggy would almost always be smoking a cigar at the table. 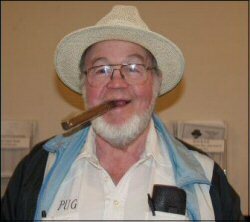 Puggy Pearson passed away on April 12, 2006 and is one of the poker greats!